Sockeye or red salmon (Oncorhynchus nerka) is the only Pacific salmon where the fry rear almost exclusively in lakes. In the ocean, sockeyes are greenish blue on the top of the head and back, silvery on the sides and white to silver on the belly. During spawning, the head become bright green and the body turns brilliant scarlet giving the sockeye its other common name, “red salmon”. Sockeyes can reach a length of about 34 inches and a weight of about 15 pounds. Most fish are around 7 to 11 pounds. 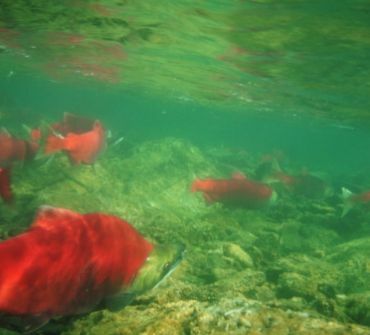 The largest sockeye populations are in the Fraser River system in Canada, and in the Kvichak, Naknek, Ugashik, Egegik, and Nushagak Rivers that flow into Alaska’s Bristol Bay. In good years, these runs have tens of millions of fish. Spawning occurs most commonly in streams that connect to lakes. We fish many rivers for Sockeye Salmon. One of the best sockeye fishing areas in all of Bristol Bay is located just 3 miles downstream from our fishing lodge in Alaska. This class V rapid slows down the sockeyes assent and literally thousands of sockeyes will be holding below the falls waiting their turn to run the rapids. It’s an awesome sight and some of the fastest fishing you’ll ever experience. 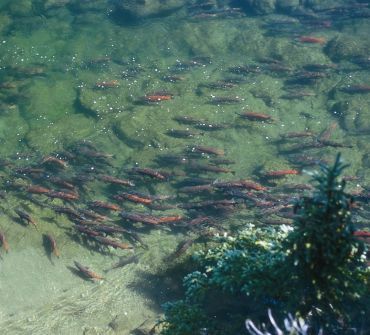 Statistically, the Sockeye salmon have the highest return rate of all species of salmon in our area. With that said, they are also the least aggressive biters. This is mainly due to the staple diet of zooplankton in the ocean. This diet surely adds to the highly desired taste, texture, and orange tone of Sockeyes flesh. But the lack of instinctively aggressive ocean feeding behavior seems to be the main reasons these fish don’t chase the fly at times. Not to worry, our veteran guides are masters at catching ALL species of fish in Alaska. I’m just being honest, they can be frustrating for some anglers at times is all! Sockeye are extremely strong fighters. Red salmon often take an angler into his backing. Cart-wheeling out of the water the whole time you’re connected. It’s not uncommon to have several anglers “hooked up” at the same time. The Sockeye are hard on your fishing gear make sure you bring a back up. During the peak sockeye season we break more rods, lose more fly-lines, and bust more knuckles than any other time of the year. And we love them for it! Come fish our Alaska fishing lodge for some of the most action packed days of Sockeye salmon fishing!